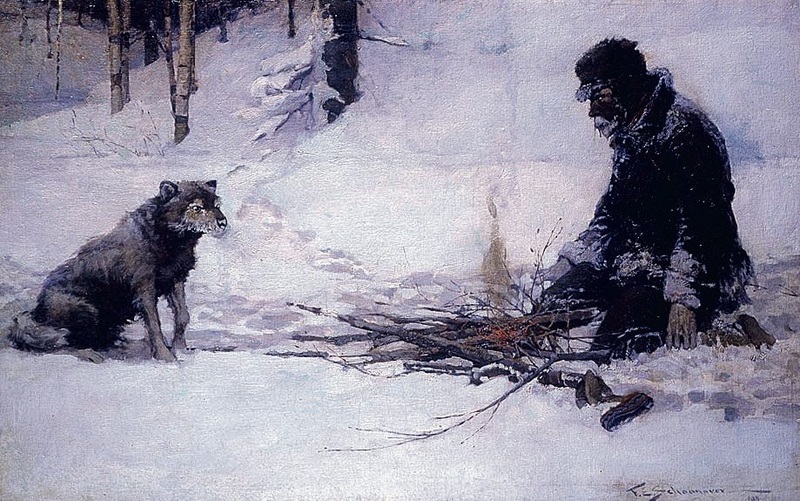 “As he looked apathetically about him, his eyes chanced on the dog.” Illustration by American artist Frank E. Schoonover (1877–1972), which appeared in black and white with “To Build a Fire” in the August 1908 issue of Century Magazine. [The original story] was purely juvenile in treatment; its motif was not only very strong, but was very true. . . . As the years went by, I was worried by the inadequate treatment I had given the motif, and by the fact that I had treated it for boys merely. . . . I had no access to the boys’ version of it, and I wrote it just as though I had never used the motif before. I do not remember anything about the way I handled it for juveniles, but I do know, I am absolutely confident, that beyond the motif itself, there is no similarity of treatment whatsoever. I can only say that it never entered my head that there was anything ethically wrong in handing the same motif over again in the way I did. . . . The stories are so dissimilar that it’s surprising the matter came up at all. 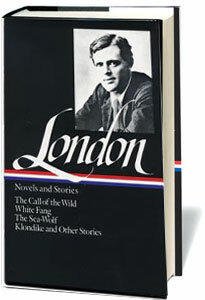 Except for the basic premise and the title, everything about the second version is different: London’s more mature and confident style, the story's length (the “adult” version is nearly three times longer), and—most significant of all—the outcome. The version for boys is instructional and moralistic; the later version is a classic in naturalism (indeed, Nature is as much a character as the unnamed traveler of the story). And, while the original version of “To Build a Fire” would surely have been lost and forgotten in the dustbins of yellowing magazines, the 1908 version is still considered by many readers as the best short story London ever wrote. Day had broken cold and gray, exceedingly cold and gray, when the man turned aside from the main Yukon trail and climbed the high earth-bank, where a dim and little-travelled trail led eastward through the fat spruce timberland. . . . If you don't see the full story below, click here (PDF) or click here (Google Docs) to read it—free! The abundance of of minute details makes the story graphic and vivid. I am from Bangalore, South India,relocated in Brookings,South Dakota.Ever since I came here I am experiencing sub zero temperatures and there have times when I have felt depressed. The story made me feel chilled to the bones, sometimes my teeth chattered. In short, I appreciated the story greatly. I appreciated the timing of it as well.